Have you seen those commercials for Lumosity.com ... Brain Games & Brain Training? Well, I kept seeing these commercials talking about playing games on this website to improve your brain, and I wanted to give it a try. My husband, sisters and mom, as well as myself all signed up for a Lumosity membership and have begun to explore the possibility of pushing our brains to their full potential and becoming smarter, sharper and brighter as the website claims. The website is a bit vague as to what it offers until you actually create an account, so here is an overview. You begin by taking a short profile which will ultimately identify which brain areas you hope to improve, then it structures a combination of 5 daily games for you to play. Each game only takes a few minutes and you are not required to play every game, every day - it is more of a suggestion to help maximize your brain training. The website games focus on 5 areas of cognitive learning including speed, memory, attention, flexibility and problem solving. Speed games focus on information processing and spatial orientation. Memory games focus on working memory, spatial recall and face-name recall. Attention games focus on visual field and focus. Flexibility games focus on verbal fluency, task switching, response inhibition and planning. Problem Solving games focus on arithmetic, quantitative reasoning and logical reasoning. Each individual game outlines the real-world benefits you should receive from playing it such as "thinking outside the box", "mental calculations", "driving safely", "faster reaction time" or "avoiding distractions". As you play these games you build a Brain Performance Index number (BPI) which is a measure of your cognitive performance based on the above mentioned areas. This number changes as you play each day and should improve as time goes on. You are also able to see how your scores compare to others in your age range that are currently registered on the site. As of today, my Best Brain Areas are memory and attention, though it fluctuates. I can see how memory is one of my strengths as I tend to be strong in that area both at work and in my personal life. And attention seems about right since I tend to be a detail-oriented person. Speed is my lowest area, so to improve this, I focus on playing more speed-related games. My BPI has raised 387 points since I began playing in mid-January! There is a lot of variety in the games, and they are all pretty entertaining. I have never been a gamer or really ever enjoyed these type of online games, but I have to say I am glad I signed up for this. It is interesting to understand the science behind Lumosity, and my BPI is rising as the site expects so maybe I am becoming brighter ...? Sure there is a fee involved, but I like the idea of pushing my brain and having a bit of fun while I do it! I can't say that I feel insanely smart as a result of this website experience, but I also don't think it can hurt anything! If I can improve things like adding numbers in my head, quickly determining a tip, remembering where I placed my keys, remembering people's names when I meet them and so on ... I think it is worth it! 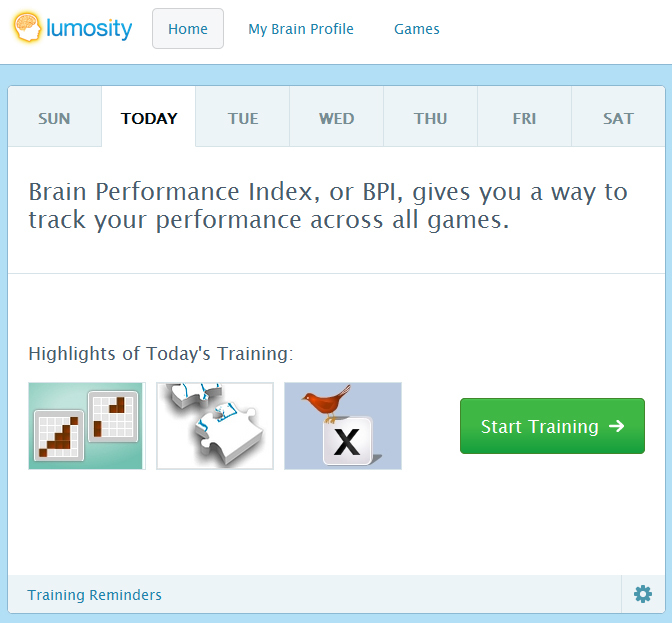 Check out the website, http://www.lumosity.com/. Also, there is an app called Brain Trainer that offers a free trail ... the app in not all-inclusive though - the desktop version has more games and stats.